PORT ACTIF is a Belgium based video art network that interacts with different art organizations worldwide by producing lectures, screenings and shows. One of the main goals of PORT ACTIF is to raise an international discourse on how contemporary cinema defies the standards of Hollywood Narration Methods to revitalize the meaning of film making. LA based film maker and Port Actif director Kristian Van der Heyden will talk about new flows and approaches within documentary-making. To illustrate the discourse PORT ACTIF selected four exemplary documentaries that are pushing the boundaries of fiction, reality and video art. The Millennium Film Workshop is dedicated to the exhibition, study, and practice of experimental film, video, and new media. An integral part of the film and video history of New York City, the Millennium Film Workshop was born during the 1960′s. Filmmaker Ken Jacobs was appointed the first director, and in the fall of 1966 he set up a film series at the church on Sunday afternoons – mostly one-person programs open to any filmmaker with a body of work. Jacobs also launched separate “open screenings,” where he led discussions between the filmmakers and audience, pioneering the one-person film-talk format in the United States and establishing it as a vital and distinctive feature of the organization. Nicolas Provost has lived in Belgium and Norway and currently lives in New York. His work has been presented in main leading art venues and film festivals. In 2008 his short film ‘Suspension’ received an honorable mention at the Sundance Film Festivaland his feature film `The Invader’ premiered at the Venice Film Festival in 2011. In his latest film, Provost cleverly appropriates recordings of the everyday nightlife in Tokyo and turns the citizens into actors by suggesting a narrative. By incorporating the classic crime genre’s tension, all citizens become suspects, provoking an unclear view on the distinguishing between fact and fiction. Surreptitious music, meaningful glances, cell phones and sirens create powerful suspense that is never resolved. Jimmy Hendrickx works and lives in Belgium and Asia. His latest short film `Semalu’ won the first prize for best experimental film at the Tabor film festival in Croatia and was first screened at the Berlin Directors lounge in Germany. Currently he is working on his first feature film. “It’s time to give up the differences between, cinema, video and theater Not only the movie itself should be changed but the complete production process is in need for a revolution." Semalu serves us with a cinematic portrait of children growing up on a construction site in the suburbs of Kuala Lumpur. Without the use of any voice over or speech, the photographic images and sound take us on a poetic journey to humble ourselves to the immediate truth of their situation. Frank&Robbert/ Robbert&Frank is the artistic alter ego of Frank Merkx and Robbert Goyvaerts. Both live and work in Belgium. They entered the Belgian art scene in 2008 by winning the first price of “De Kunstbende” and were selected for the Start Point Prize in Prague in 2012. Their final MFA-project ‘What about American history’ has been screened at more than 40 venues all over the world. Their latest film is an experimental abstract narrative about the symbols of power. They use found images and sound, taken from the cloud of mass media, juxtaposed with seemingly random images of their own travel logs, only to distort our suspension of disbelief even more. The audience is left behind with an uneasy sense of substance in a audiovisual world of few rules to none. Ezra Eeman is now a senior Journalist with the Flemish Media Society, reporting news from Belgium and abroad. 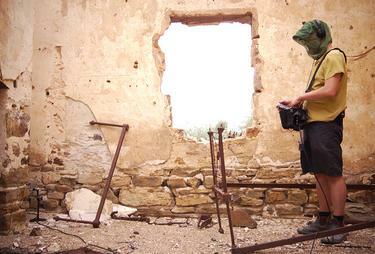 He has traveled all over the globe to document `the latest` and makes video art and mixed media installations. Quies deals with the journeys of sound artist Peter Lenaerts who has been obsessed with empty spaces for years. Last year he travelled along the Oodnadatta Track in Australia’s arid and desolate center in pursuit of the emptiness and nothingness he’d experienced there the year before. Filmmaker Ezra Eeman travelled along and captured Peter’s struggles with wind, and flies, and his ultimate failure at recording silence. For silence can not be recorded, or can it? And if it could, it can not be replayed. Or can it?